Beat well--yolks, cottage cheese, and butter. Beat the egg whites till fluffy and stiff. Blend into the yolk mix, cautious not to over-stir. OPTIONAL - just beat everything together, they are still fluffy and fabulous!! FOR WAFFLES - add a little more flour if you want them to be a bit denser. Spoon onto hot greased griddle. When little bubbles form on the top, turn them over. Serve with genuine maple syrup or agave nectar. 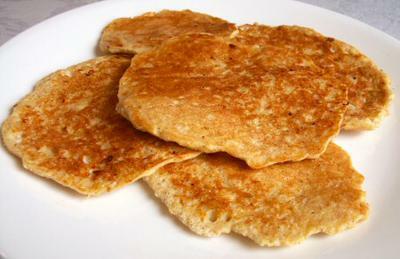 some of the best pancakes we have ever eaten, and so simple to make. thank you!